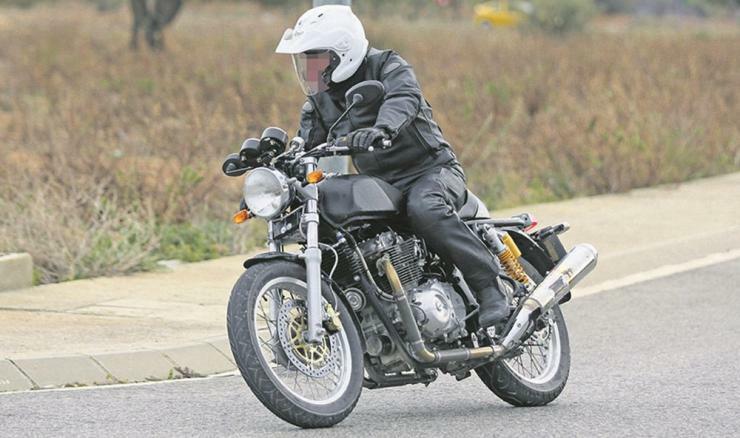 Royal Enfield 750cc twin cylinder bike: Finally, in India! Last year, Royal Enfield started testing its first ever twin cylinder bike in UK and we had brought you spy shots of the same back then. 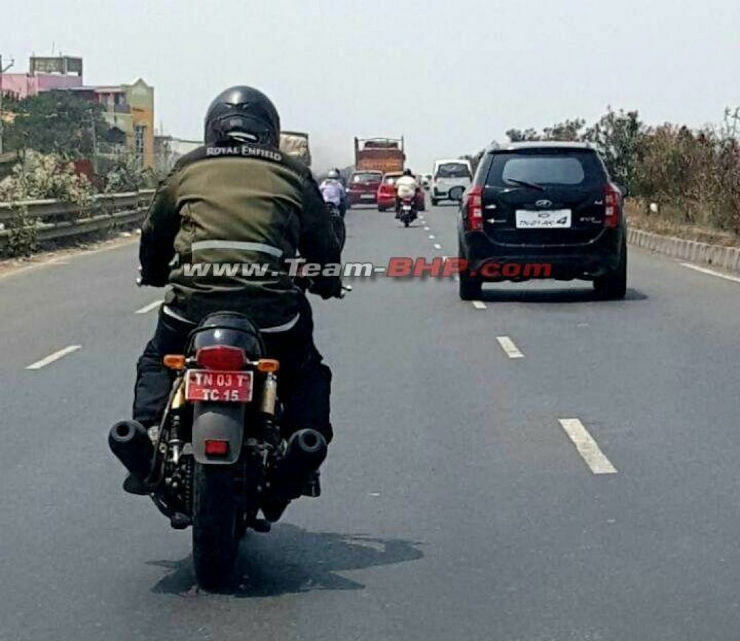 Well, the 750cc, twin cylinder Royal Enfield has just arrived into India, and here are the first spy shots of the bike testing here, courtesy Team Bhp. From the spy shots, it is tough to see what this bike would look like. In its current avatar, it looks like a souped up Continental GT, something which we expect will change when the bike is actually launched. The most noticable change though is that this bike features a dual exhaust layout, something that is not offered in the current GT. Changes have also been done to the frame of the bike to incorporate the larger engine. It also has a revised indicator placement at the back and a new rear suspension setup. There are no specifications that have been revealed on this engine, however it is rumored to be a 750 cc unit which will produce around 50 Bhp and 60 Nm. The first bike that was spotted abroad was running carburetors, which is something we aren’t sure will make it to the final production version. The Continental GT already has gotten fuel injection and with the Indian emission norms becoming more stringent, we could possibly get a fuel injected version. When it is introduced, it will end up being the fastest Royal Enfield on sale. Royal Enfield is looking to take on the Harley Davidson Street 750 with this premium offering. There are no other bikes in that segment currently and this could be an interesting alternative to those looking at a more upmarket and premium bike. The bike is expected to be launched by the end of the year. It will be the company’s flagship product when introduced and will be priced around the Rs 3-4 lakh mark.